The Times this afternoon reports that the Mets are close to a deal with Japanese reliever Ryota Igarashi of the Yakult Swallows. From what I've read Igarashi is either a righthander with a deceptive motion and good control, or a wild righty who throws mad heat, but should be considered to be a late-inning relief candidate in any disguise. All the photos I've seen indicates he prefers to wear No. 53, which happens to be Jerry Manuel's number. In other words, if the Mets don't get off to a hot start, he can have it on Memorial Day. I made the mistake of listening to WFAN while I moved the car last night and was blown away by the fire of stupidity Mike Francessa was stoking among fans competing with one another to be the most wounded by the news that the Phillies were to acquire Roy Halladay (at the cost of Cliff Lee, a multiyear, multimillion extension and some prospects) and the Red Sox had signed John Lackey for five years and $85 million. Ira on the Car Phone announced his intention to stay away from CitiField forever and demanded the Mets part with Jose Reyes (cuz we need less offense) while Francessa just let him talk. My confidence in the Mets' ability to do the right thing for the club is shaky at best, but that's mainly due to those occasions when they kowtow to the demands of Francessa's listeners and columnist hacks like John Harper of the Daily News (THE METS MUST SIGN LACKEY he demands as hunting season opens and "THE METS NEVER HAD A CHANCE" he taunts at the end). The JJ Putz trade, which I'll never stop maligning, was a perfect example. If this tricky offseason has shown anything so far it's that the Mets haven't turned themselves inside out only to create the illusion they've solved their problems or to win a meaningless competition to make the biggest offseason splash. They can certainly do a better job standing up for themselves in the meantime, but I'm glad they aren't getting pushed around, so far. Kudos too to the Phils for boldly making the moves they feel they have to to stay on top. It wouldn't be any fun to know your opponents weren't also trying. Happy thanksgiving! There is a 21-pounder in the brine now and half the guests can't make it so I may have to open a Brooklyn outpost of Capriotti's. If you ever find yourself hungry in Delaware, I'd suggest you memorize those locations. So the new uniform announcement came and went in time for your holiday shopping derby, without a runway fashion show nor any of the garish alternates the Mets had asked about earlier this year. Of course they screwed up the new creamy pinstriper by including the unnecessary black dropshadows (and names on back, I'm pretty sure) and failed to throw out the black completely, though that was a little much to dream for an organization that only now has come to realize that Met fans wanted some Mets with their new stadium. I try not to get angry anymore. I think it might be best at this point to look around at the people you're spending Thanksgiving with and realize the Mets are run by a group not unlike them -- peculiar unto itself, kind of hard to explain to outsiders, and at times, just completely, astonishingly, bewilderingly, irritatingly, embarrassingly, mind-bogglingly clueless. Spending 81 holidays a year with them would probably drive you crazy at some point too. 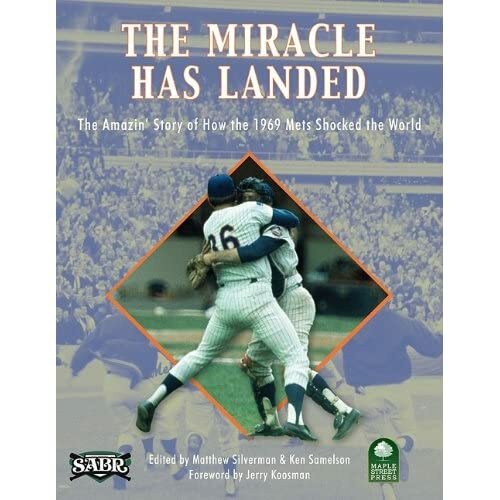 If you haven't seen it yet, The Miracle Has Landed, an offshoot of SABR's Biography Project focusing on the 1969 Mets, is out now from Maple Street Press. I contributed two chapters including an interview with reserve infielder Kevin Collins, who I'm happy to report was absolutely thrilled to learn that he was the first player in team history to wear four different uniform numbers. But the book's real highlights are contributions from some terrific folks like Matt Silverman (who co-wrote my book and co-edited this project); Greg Prince; and my friend Edward Hoyt. Being associated with these guys as friends and collaborators is something I have to be thankful for in what was otherwise a rough year to be a Met supporter. Thanks also to all the regular contributors to the chatter at this site including Alex. And to my web guy David Moore, with whom I hope to complete another site overhaul this offseason. We have more new coaches! Say hello to new third base guy Chip Hale (No. 5 with the Diamondbacks last season) and bench coach Dave Jauss (No. 50 with the Orioles last year). We'll update that info as it comes in. Quick note to inform everyone we're still here, wearing our Phillie Phanatic Underoos and puzzling over the perceived lack of conviction among Met fans for rooting interests this World Series. We had some computer issues, busy work schedules and sickness, but will have new Met related stuff up soon. Hey Met fans: Root for the Phillies. The way I see it, the Phils beat the Mets, they may as well beat everyone. And they're the only team this postseason -- certainly the first to face the Yankees -- that hasn't gone around playing the kind of embarrassing baseball we've already seen too much of this year. So if you're still on the fence, don't let rhe media trick you into buying Mets-Phillies as an overwrought drama in the vein of Red Sox-Yankees: Support your league, take what consolation you can in acknowledging the Mets fell to a terrific team, and hope the Phillies get their Phil this time around (if ever) and subsequently begin the the kind of sad death-spiral that all multichampionship teams eventually encounter. Oh, you SHaMs, you. Way back at the All-Star Break when we naiively dreamed you had a run in you, we speculated it would take at least 45 victories out of the final 75 games for a realistic shot at the postseason, and a sizzling 50 wins to be safe. To my horror, my anger, and eventually my acceptance, the Second Half Mets went and lost 47 of their next 75. Only a freak 3-game sweep against the mailed-it-in Astros this weekend stemmed the bleeding at 92 losses, and assured the SHaMs wouldn't reach the magical 50-loss post-all-star-break plateau. Still, it's a pathetic showing thoughout, and tragic to have missed such a great opportunity to be the kind of up-against-it underdog the fans could get behind. The question shouldn't be, "Has any team ever lost so many players to injury?" It ought to be "Has any team ever lost so many players to injury and failed to replace even one of them adequately?" Right? We got Jerry's passive skippering, a parade of nondescript clockpunchers and a team that until the end preferred to play Schneider over Thole, and anybody over Evans, while even the regulars loafed about, made ridiculously costly errors, threw ball four eight times a night, whiffed with runners on third, bunted in every situation except those that might drive in a run, and indifferently flew out to medium right while while gift-wrapping signature moments for nearly every team they played down the stretch. It's obvious that Jerry ought to be fired. He hasn't gotten though to the players, the team barely had a single good run all year, and his passive managing style ("Hey. let's go out there and try not to lose!") drives me crazy and doesn't work. Omar should have been whacked last season for sitting on his hands while the Mets shanked a second gimmee putt, and the strenuous, reactive fiasco of acquiring not one but two faltering closers last offseason only to see the SS Met spring a few hundred other leaks, many of them completely foreseeable and potentially preventable (starting pitching, Brian Schneider, right field) should be answered for as well. They won't be. Instead the Mets are making a show of blaming a development staff for failing to make major-league ready replacements of the 16-year-olds they signed in 2005. That and promising to try and do better. Hey, good luck, Mets! I'm going to go ahead and name Luis Castillo the MBTN Player of the Year for 2009. He atoned for a bad season in 2008, he committed the signature screwup in a season jammed with them, but most of all, he really loved to bunt. May his example of improvement through desperation revisit the Mets in 2010. There were 52 53 Mets in 2009, including 26 first-time players. The Number of the Year is 29: Issued to three of those 26 newbies, and one repeater who I've already forgotten was a 2009 Met: Emil Brown, Andy Green, Robinson Cancel and Tobi Stoner. We'll be back to keep current with the hot stove and other stuff too! For now, go Jets!